President Barack Obama celebrated his 51st birthday today with a round of golf and plans for a weekend away at Camp David, taking a break from campaigning three months before Election Day. Barack Obama played golf with a group of friends and aides at Andrews Air Force Base before heading to the presidential getaway in Maryland’s Catoctin Mountains. 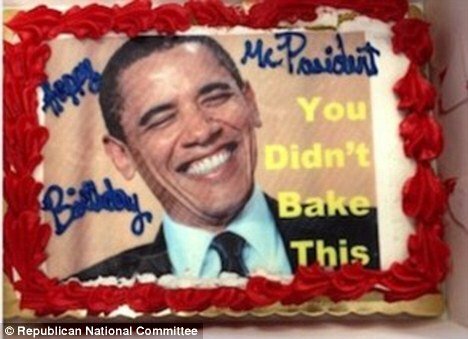 But, before Barack Obama escaped to begin any celebrations, Republicans acknowledged his birthday by delivering him a tongue-in-cheek cake. His opponents leaped on the gaffe with Mitt Romney seizing the quote to question Barack Obama’s commitment to small business while the President and Democrats have said the quote was taken out of context. DNC officials promptly sent the cake back to RNC headquarters, along with a copy of a recent report by the Tax Policy Center that found that Mitt Romney’s tax proposal would give millionaires a broad tax cut at the expense of tax breaks enjoyed by many middle-class families. However, Mitt Romney’s team has disputed the study, saying his tax plan would benefit all Americans. Barack Obama returns to campaign mode next week, with fundraisers in Connecticut on Monday and campaign rallies in Colorado on Wednesday and Thursday. Next weekend, Barack Obama will hold several birthday-themed fundraisers in Chicago, including one at his family’s South Side home. Barack Obama’s campaign used the event to drum up small-dollar donations before the end of the July fundraising deadline, offering two lucky winners the chance to attend the fundraiser at Obama’s red brick home. In an email to supporters, Barack Obama warned that his birthday “could be the last one I celebrate as president of the United States, but that’s not up to me – it’s up to you”. Barack Obama’s team has warned that he could be outspent by Republicans and GOP candidate Mitt Romney. Barack Obama got some early birthday wishes on Thursday during a rally in Florida, when supporters serenaded him with “Happy Birthday”. The president joked that his birthday wishes “probably would have to do with electoral votes. Winning Florida wouldn’t be a bad birthday present”.